The most obvious, this relates to the size and potency of an individuals "social graph", or if you are looking at it from a traditional perspective it's the "platform" an individual has which helps them be heard. This is likely overlooked with the exception of those who study network dynamics. Proximity indicates the relationships between people and how they are connected. Close proximity or ties typically indicate friends relatives etc, while loose ties have less proximity. Both ties however can be effective in influencing behavior. Perceived expertise in topics or subject matter establishes influence as well though is difficulty to pin down and measure. There are correlations between reputation and authority here as well. But if an individual establishes themselves as having expertise (validated by trusted sources) this becomes a major factor. The relevancy of influentials to their communities, networks or audiences is also a significant indicator which affects how much influence one has the potential to yield within that group or community. Established by the activities of individuals through their thoughts, actions and what they generate. 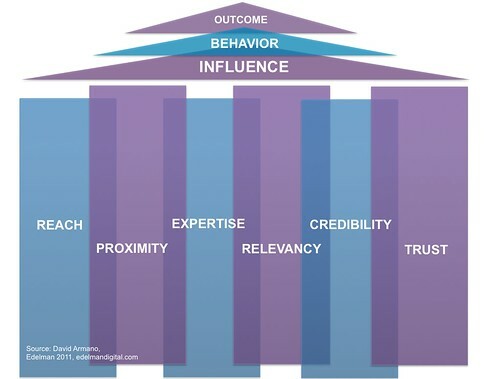 Indicators of credibility are tied to reputation, word of mouth, referrals etc. Often a result of several of the above factors but extremely critical in the effectiveness of influencing a thought, behavior or action. Friends and peers can be trusted sources in cases while in other cases, known or unknown entities with perceived expertise. While there are likely other important factors—these are good indicators though some are difficult to quantify (such as credibility). However the amount of times an individual is mentioned by others on a specific topic and the link to how much visibility is generated are metrics which can be measured. So how are you thinking about influence these days?